Lemoine FitzGerald resided his whole life in Winnipeg. 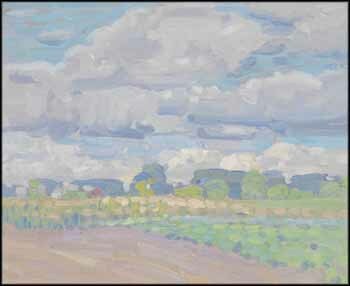 During his early years he spent summers at his grandmother's farm in southern Manitoba at Snowflake, and the vivid impressions he gathered there would inspire his painting. Later, he would often cycle from his house out into the open prairie to the area of Stevenson Field, attracted to what he described as the "intense light and the feeling of great space." From 1912 to 1921, FitzGerald worked as a commercial artist and painted. Despite his relative isolation in Winnipeg until he met Group of Seven artist Frank Johnston in 1921 (he would become a member of the Group in 1932), he was well aware of the current modernist movements, having absorbed information from art magazines, books and museum shows. His work strongly shows the influence of Impressionism in the early 1920s, as demonstrated by Prairie Landscape, with its soft pastel palette, sun-drenched atmosphere and dreamy cloud-laden sky. FitzGerald's expert brushwork, varying from square dabs to long, fluid strokes, is another pleasurable aspect of this lovely work.